When Scott Stricklin went searching for a new football coach Dan Mullen was the first name that popped into his mind. Stricklin was an associate Athletic Director under Greg Byrne at Mississippi State when they hired Mullen away from Florida. He kept that name in mind and went about the search, not wanting to leave any stone unturned. Ultimately he came back around to Mullen and handed him the keys to Gator Nation. 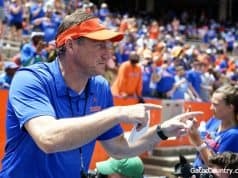 This was a huge opportunity for Mullen, to come back to a school where he had success as a coordinator and try to replicate that as the head man. It was also a huge decision for Stricklin, who was making his first major coaching hire as the Athletic Director at Florida and in a sport where his predecessor had whiffed badly the last two times he made a hire. Mullen won the fan base over on his “relentless effort” spring speaking tour but not many groups are as fickle as sports fans. Mullen was writing checks when he talked about scoring points and winning games and championships. If those checks bounced in the fall there would be some angry people with much more pointed questions waiting for him this coming spring. It looked like things might take a turn that way when for the first time in 31 years the Gators lost to Kentucky. At home no less. Streaks aren’t meant to last forever but losing to Kentucky sure seemed like it might test that theory. Sources close to the team say Mullen wasn’t yelling in the locker room post game. He felt the pulse of the team and where they were and went a different route. 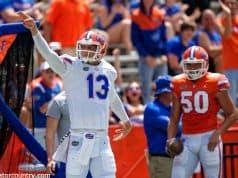 The Gators clobbered Colorado State, trucked Tennessee in Knoxville. Then beat a top-25 ranked Mississippi State as the entire town of Starkville showered their former head coach with boos and vulgarity upon his return. Florida bested No. 5 LSU at home before going back on the road for the third time in a month to beat Vanderbilt. From 1-1 to 5-1 in a month’s time. Florida lost to a better team when they faced Georgia, Kirby Smart has a head start on Mullen, one that will need to be closed but isn’t there yet. Then Florida lost the following week to Missouri. The Tigers have had Florida’s number or, perhaps, Florida let Georgia beat them twice. No matter the case Mullen told his players that they still had a chance to go to a New Year’s Six bowl game and they had more to play for. Florida beat South Carolina 35-31 and had more than 500 yards of offense. They put up 600 against Idaho and 536 against Florida State. It was the first time since 2008, when guess who was calling plays, the Gators have accumulated 500 or more yards in three consecutive weeks. Florida, with a game left to play, has already amassed more total offense than they had in any of the previous eight seasons. It’s only year one but Saturday told a story in itself. This was the first time since 1960 that both Florida and Florida State faced off with first year head coaches. Florida is going to go to a prestigious bowl game. Dan Mullen celebrated on the field with his players while FSU coach Willie Taggart opened his press conference with an apology. Florida had a different kind of message after the game. Meanwhile, Stricklin is a member of the College Football Playoff Committee and he’ll have a smile on his face when he’s asked to leave the room. 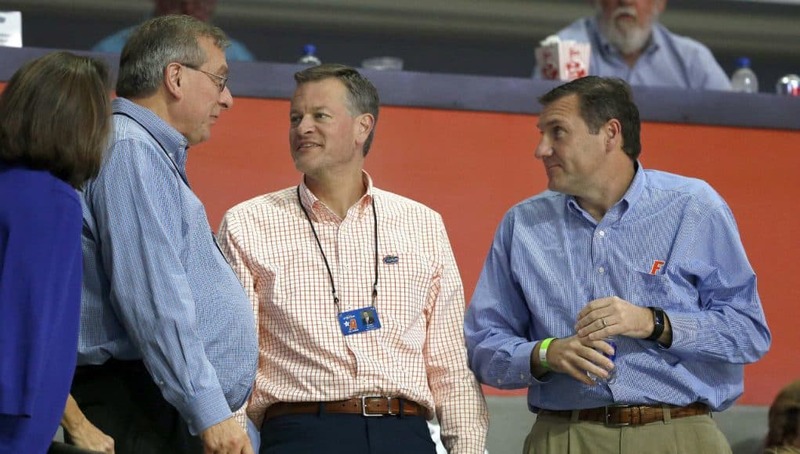 That means the committee is discussing his school and their chance to go to a coveted New Year’s Six Bowl game and it serves as just another point to show Stricklin made the right call when facing his biggest decision of his career at Florida.